There’s a huge crash of thunder, and suddenly it’s pitch black in your house. You know you have a flashlight and candles somewhere, maybe in a closet or a drawer, but how do you find light when you’re already in the dark? The Nite Finder flashlight from Jenesis solves this classic emergency lighting conundrum. Using Low Glow technology, the Nite Finder glows continuously for four or more years; making it effortless to find if a big storm hits or that faulty breaker blows again. Once found the light can be used as a normal flashlight or turned to lantern mode to provide a soft, wide-angle illuminate for your kitchen table, backpacking tent, working on your car. All of the designs are finalized, and we’ve been having lots of fun with the prototypes, and now it’s time for the tooling and manufacturing phase. And here is where we really need your help! 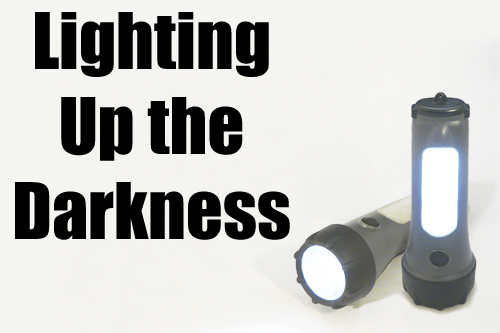 We’ve started an Indiegogo campaign and if you’d like to help a small Michigan-based company get into the flashlight market, we could really use your support. We’ve been trend setters in other product categories before, such as battery powered LED candles, and we think this Low Glow feature will have a big impact in the world of flashlights. Within a few years this feature could be on nearly every flashlight in the stores, and who knows what other great features we could bring to the table. Unfortunately, being a small company we don't have the cash to cover the cost of factory tool-up and the first production run ourselves. But, with your support, we can take the Nite Finder from design to finished product and by way of gratitude we’ll make sure you get one of the first to come off the line. Help us make this innovative new design a reality and we’ll send you the most versatile home flashlight you’ll ever own. Every donation receives one of the first Nite Finders we produce. Support the Nite Finder, help us get our foot in the door of this exciting new product territory, and make it the first of many fantastic Jenesis flashlights!